Forget everything you know about the rudiments of modern religion for a moment and imagine an ancient world where holy apparitions revealed themselves to humans through divine artwork. 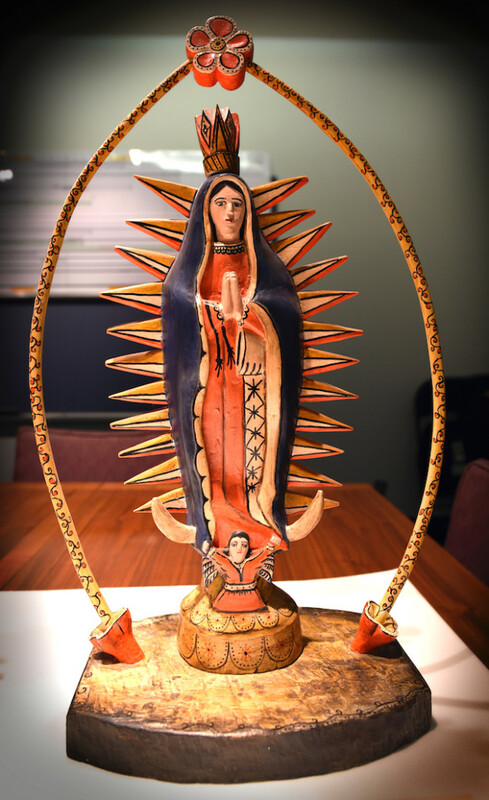 The story of the Virgin of Guadalupe—the subject of the Houston Museum of Natural Science’s latest exhibit, La Virgen de Guadalupe: Empress of the Americas, opening this coming Friday—is one that has been told countless times and with an eternal sense of enchantment and speculation. Dr. Dirk Van Tuerenhout, curator of anthropology at HMNS, leaned on the significance the narrative had on the establishing of a religious culture in the burgeoning nation of Mexico when putting the exhibition together. The exhibition takes viewers back to 1531 when Juan Diego, a Roman Catholic saint living outside modern day Mexico City, saw a vision of the Mother Mary. After his story was taken as fable, Diego went back to the spot where he encountered the vision and found a number of wild roses growing among the rocks and barren surroundings. Taking this as divine proof, he wrapped the roses in his garment and hurried back to his naysayers. The image of the Virgin, which coincidentally appeared now on his shirt, became what is known today as the Virgen de Guadalupe and aided in establishing a culture and religion within the nation of Mexico. According to Van Tuerenhout, the importance of the Virgin of Guadalupe spans far beyond the religion of Christianity and is applicable to any person who seeks knowledge of the ancient world. Dr. Dirk and his team at HMNS designed a five–tiered exhibit that takes the viewer from the Muslim invasion of the Iberian Peninsula in AD 1492, all the way to the appearance of the Virgin to Juan Diego in 1531. The exhibit begins with three sections that give insight into the cultural climate and identity of the indigenous people of Mexico. The symbol of the Virgin became a badge of individuation and strength for this people group. The following sections of the exhibit skillfully lead visitors up to the time that Juan Diego encountered the Virgin and give momentous insight into the struggle of the primitive Aztecs of that region. Although the original image of the Virgin Mary is not displayed, there are educational components and authentic manuscripts from the time period that give detailed accounts of Juan Diego’s experience.